Happy Saturday!!! It's been raining here in Ohio and I'm sure that is making all the ducks and Canada geese very happy...as well as the frogs! So with that in mind I used "Froggie Lillypad" for my Design Team Spotlight card over at Kitty Bee Designs. 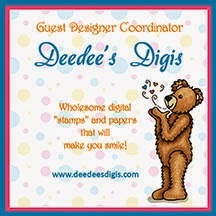 Kitty Bee Designs are fun little critter images that are so easy to use! I colored my frog with Spectrum Noir markers and then used some papers I had on hand in my stash. His heart is colored in with Stickles. Thanks for stopping by! God bless you!!! Very cute! Thanks so much for playing along with us at QKR Stampede this week! Great card, so cute. Thanks for joining us this week for our "Anything Goes/twist of Gems or Rhinestones." Come back to join us again and good luck.